Freight railroads train tens of thousands of first responders each year. Railroads closely collaborate with industry and government partners, including the Federal Railroad Administration (FRA), the Pipeline and Hazardous Materials Safety Administration (PHMSA), the Transportation Security Administration (TSA) and the Federal Emergency Management Agency (FEMA). Railroads provide a 24-hour emergency hotline number for first responders to call in the event of an emergency. Railroads have teams hazardous materials (hazmat) safety and emergency response experts strategically located throughout the nearly 140,000-mile freight rail network that are available 24/7. All the major railroads have their own dedicated police force that works alongside emergency responders in the event of an emergency. Freight railroads share with first responders a fundamental commitment to the safety of the communities they serve all across the country. For decades, that commitment has been demonstrated in many ways, including support for communities and the men and women who protect them — before, during and after a railroad incident. The nation’s freight railroads collaborate with different partners and government organizations to train tens of thousands of emergency responders each year with programs ranging from general rail operations to detailed hands-on rail response courses. Railroads regularly provide funding to emergency responders in their service areas to attend training courses at the world-class Security and Emergency Response Training Center (SERTC) training facility in Pueblo, Colorado, which offers extensive hands-on training for hazmat incidents involving surface transportation. While at this high-tech facility, first responders from all over the world train on the actual transportation equipment they will encounter in the field. For those unable to attend in-person, SERTC and the railroads created a free, web-based training course that provides first responders the basic knowledge needed to respond to incidents involving crude by rail. TRANSCAER® (Transportation Community Awareness and Emergency Response) is a voluntary, national network that promotes the safe transportation and handling of hazmat. TRANSCAER members consist of volunteer representatives from the chemical manufacturing, railroads, distributor, and emergency response industries, as well as the government. TRANSCAER provides over 400 training opportunities annually to first responders, and railroads partner on the delivery of some of this training. One key rail component is the TRANSCAER “safety train,” a rolling classroom that travels from community to community to provide hands-on training to local first responders. To meet the varied training needs of first responders, railroads visit hundreds of local firehouses each year with classroom and face-to-face hazmat training. Additionally, railroads regularly partner with local emergency responders to conduct emergency simulations, known as “table top drills,” to help streamline communication and improve response in the event of a hazmat incident. Like the SERTC crude by rail online training, railroads provide self-study programs to emergency responders so students can learn at their own pace. AAR partnered with government and industry partners to develop the free TRIPR online training to teach first responders how to safely manage incidents involving flammable liquid unit trains, such as crude oil and ethanol. Railroads communicate with communities, first responders, state agencies and other relevant organizations to educate and inform them about hazardous materials that move through their communities. Freight railroads work with government and industry partners to continually develop tools and systems that manage and assess potential risks of moving hazardous materials by rail. For example, railroads partnered with the Federal Railroad Administration, the Pipeline and Hazardous Materials Safety Administration, the Transportation Security Administration and the Federal Emergency Management Agency to develop the Rail Corridor Risk Management System (RCRMS). This sophisticated statistical routing tool analyzes 27 risk factors including hazmat volume, trip length, population density along the route, and emergency response capability to select routes that pose the least overall safety and security risk. Railroads equip train dispatchers and crews with information about hazmat on trains with detailed emergency response information specific to those materials. Upon written request, AAR members will provide bona fide emergency response agencies or planning groups with specific, confidential commodity flow information covering all hazardous commodities transported through the community. Additionally, railroads notify State Emergency Response Commissions (SERCs) about the routes of trains carrying one million or more gallons of Bakken crude oil in their respective states. Freight railroads actively collaborate with representatives from local fire and health departments, education institutions, industry organizations, transportation departments and the public to help communities develop and evaluate their own emergency response plans. 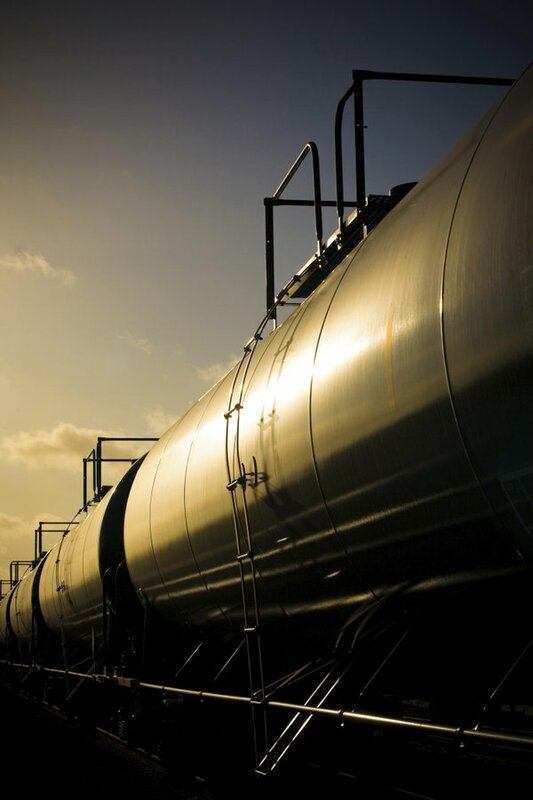 To better prepare first responders for a potential hazmat incident, railroads developed and share an inventory of emergency response resources — including the location of response equipment and emergency contacts — along crude oil routes with local emergency responders. In addition to formal information sharing, freight railroads have regular on-the-ground collaboration with emergency responders through frequent review sessions and training exercises, which include discussions about the hazardous materials being transported through a given community. In the event of a hazmat by rail incident, the train conductor provides first responders with specific train and car consist information so they can quickly and effectively respond to the emergency. The railroads have emergency response teams strategically located along their routes who can work directly with first responders on-the-ground at the site of an incident. The North American Class I railroads, AAR, Railinc Corp. and TTCI developed the free mobile AskRail™ app. The app provides emergency responders with immediate access to accurate, updated information about railcars carrying hazmat at the scene of an incident, so they can make informed decisions about how to effectively and safely respond to the incident. The app also provides the Emergency Response Guide Book and all the emergency hotlines for the class I railroads. AskRail is only available to qualified emergency first responders and is a safety tool that acts as a backup resource if information from the train conductor or train consist is not available. With the Polar Vortex triggering the coldest Arctic outbreak in the past 20 years in parts of the Midwest, see how freight railroads keep trains and employees safely moving during winter weather — from blizzard buses to hot technology (literally). As historic flooding continues in the Midwest after large snow melt and heavy rain, see how railroads collaboratively prepare for and respond to weather threats to minimize network impact.